I do love the Aberdeen Whisky Shop. It’s a nice wee shop in my home town with great staff but….OMG, the website! It’s been sitting there with one page saying, “online shop coming soon” since about 2013. But this is a perfect example of how crazy the whisky market has gone in recent years. The statement “you must be online to make money” doesn’t apply to whisky. If you have a shop in the centre of Scotland’s third largest city you get enough walk-in trade to make ‘online’ become ‘on hold’ until market forces change. But it is frustrating if you find the Aberdeen Whisky Shop online and you don’t live anywhere near the city. At least they give regular updates about new stock via their Facebook page. 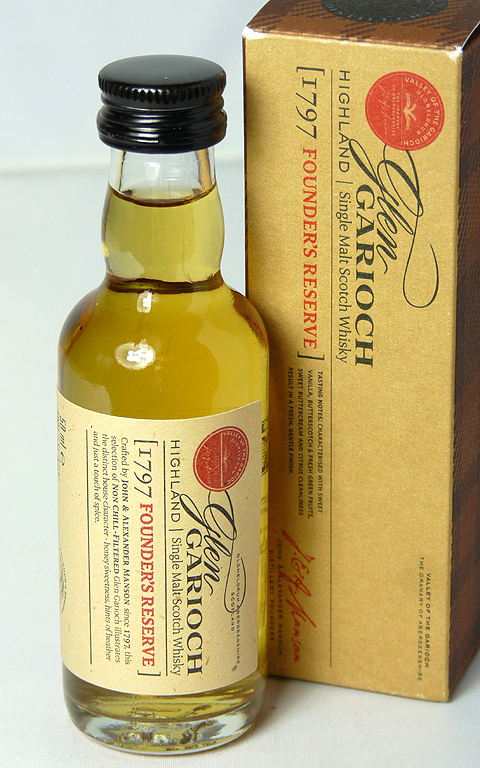 I hadn’t intended on buying this Glen Garioch but I was in the shop, it was there, and the rest is history. Generally I’m not a fan of immature whisky but after visiting Glen Garioch in 2016 I was keen to get more examples from the distillery. Distilled in 2011 and bottles in 2017 this 5-year-old was limited to 665 bottles. It has no added colour, and it’s non-chillfiltered but it’s a shame it isn’t cask strength. I suppose it’s a lot to ask for a mere £36 and 46% is a decent enough potency. Definitely one to be drunk as I don’t see this making much as an investment. The bottles aren’t individually numbered and it comes from 2 bourbon barrels rather than single cask. There’s no box and the label is very basic, which all says, “drink me” rather than “keep me for 10 years then sell me”. The independent bottlers Morrison & Mackay that make this whisky certainly know their marketing. Nose: Coconut, white oak spice, vanilla-forward barley. Palate: Freshly cut grass, mint leaf and more sweet coconut notes. Finish: Soft citrus and toasty oak. If you’re visiting Aberdeen, Scotland’s third largest city, and you fancy a distillery tour, I’d recommend a trip to Glen Garioch. The distillery is situated in the town of Oldmeldrum, which is about 18 miles from Aberdeen. If you’re driving then the distillery has a strict policy that you can’t drink a dram at the end of a tour but you get to take away samples. Thankfully there’s a bus service from Aberdeen to Oldmeldrum and Glen Garioch is a short walk from the town centre. The No.35 bus takes about an hour, which is a lot longer than by car but gives you time to take in the scenery and drink without fear of prosecution. The tour kicks off with a short video in the Visitors Centre about the history of the distillery. Glen Garioch is currently owned by Morrison Bowmore Distillers Ltd (MBD) who also own Auchentoshan and Bowmore. MBD became part of Beam Suntory in 2014, the third largest spirits company in the world. Not that any of this was apparent at Glen Garioch, which felt very grounded in its Aberdeenshire community. When I initially booked the tour online I spoke to a lady called Fiona but a different Fiona took us on the tour. Apparently there are four different Fionas working at the distillery in a very ‘family’ atmosphere, which was clearly evident from the staff we met. Glen Garioch had its own maltings in use until 1993. The distillery fell silent in 1995 with production starting again in 1997. It was because of this historic rebirth for the distillery that I bought a bottle at the end of the tour distilled in 1997 and bottled in 2012. The website mentioned a ‘bottle your own’ for £80 but during the tour the only options available were £135 and £190 per bottle. The lesson learnt here was not to trust their website with regards to the ‘bottle your own’. Email them beforehand if that’s something you’re interested in. Fiona our tour guide was very knowledgeable and the tour itself was thorough and enjoyable. We went into the old maltings and walked through all the buildings step-by-step, following the creation process of whisky. At the end my chosen drams for tasting were the standard 12yo and 15yo, both of which were excellent, with honey, spice and hints of heather. I’d also recommend the entry-level Founder’s Reserve, which is delicious, affordable and a generous 48%. Since my visit it has been discovered that the distillery is actually older than originally thought. Instead of 1797 an article from the Aberdeen Journal published in 1785 refers to the sale of spirits from the Oldmeldrum distillery, which is Glen Garioch. It’s still not the oldest distillery in Scotland but not far off. Overall I’d thoroughly recommend visiting Glen Garioch. If you’re considering moving to Oldmeldrum and looking for work, change your name to Fiona and apply to the distillery. It’s bound to work! Over 4 years since Ralfy’s review and the good news is that this Founder’s Reserve is still bottled at 48%. Unfortunately there remains no mention on the bottle of “natural colour”. Oh well, maybe one day! The Whisky Bible 2013 rating suggests that standards have remained much the same but it’s not always that Jim Murray and Ralfy agree. That’s the joy about whisky – one person’s jam is another person’s marmite. Actually, it’s a pain in the backside because no two sets of tastebuds are the same. So you can’t be certain you’ll like a whisky just because someone else says it’s delicious, such is the complexity of a whisky’s taste. Reviews can help as a guide but it’s up to everyone’s individual taste to discover what they like.